My first real Vancouver design. 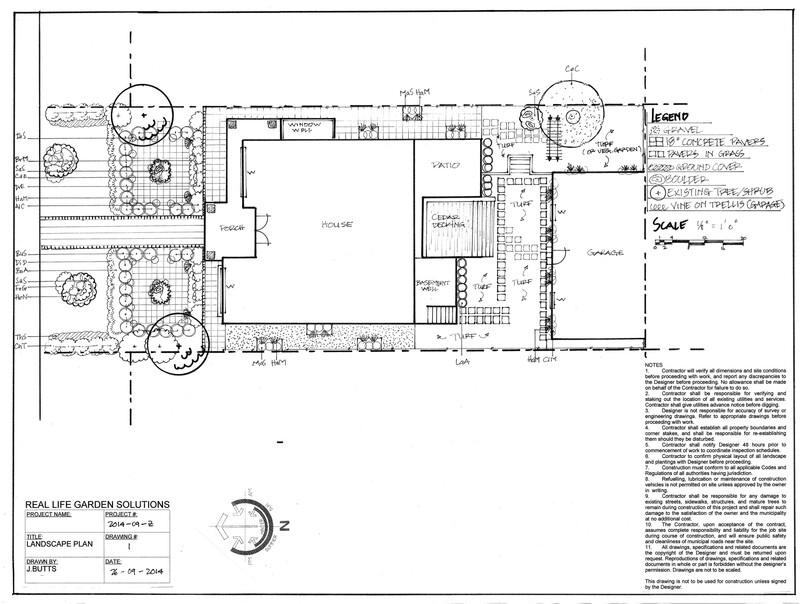 I’ve had clients in all the ‘burbs, so was really pleased when a contractor in (city of) Vancouver consulted me. This house is in the final stages of completion–they were installing the kitchen as we did out final rounds. A traditional-styled house with a contemporary feel, all in cream and white. I did a formal-ish design, very recto-linear, but with softer shrub and perennial borders. the back is very simple, needing mostly turf, but with potential for a vegetable garden. (Clearly, I have to consider spacing a little on the page more carefully so I don’t have various elements squeezed into too little space! The Legend and Scale on the one side and the plant list Key on the other…) Click to enlarge image. If a portion of the design needs a little more clarity I’ll do a SketchUp model (very simplified) in order to communicate what the plan view can’t. 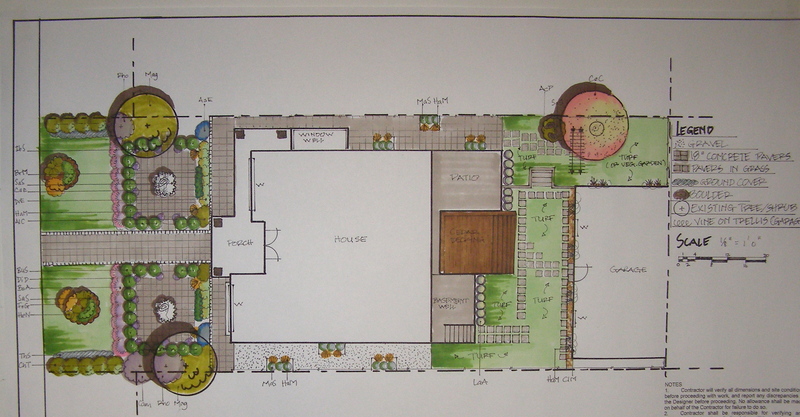 In this case it was how the grade change would look with a retaining wall and steps for access, with a tiny back yard seating area (between two garages) that could easily be converted to a vegetable garden (client’s request). A small back yard with an interesting feature–a slope! Those who know Richmond know that it’s FLAT. But on this property there is a steep slope of about 25-30º at the back end. Thus the owners “lost” about 15′ of depth, or 700 s.f. of yard. 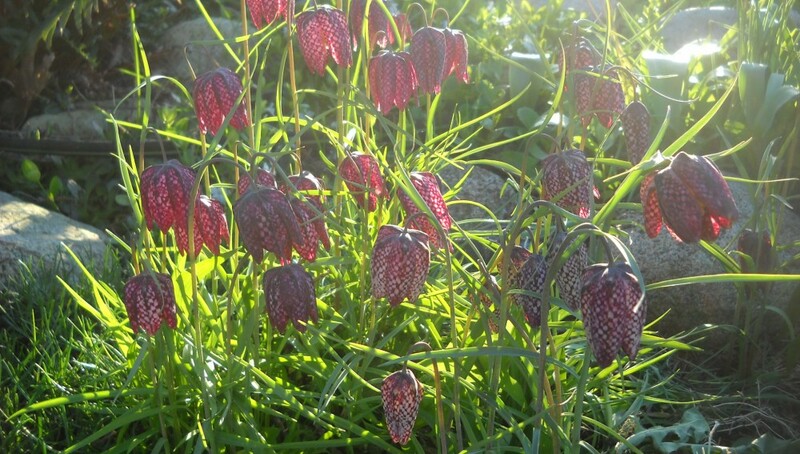 So they were having a retaining system installed–SierraScape Systems. The house is a very “cuboidal” style, so I contrasted it with lots of semi-circles and curves. Need to work on colour “subtlety”! 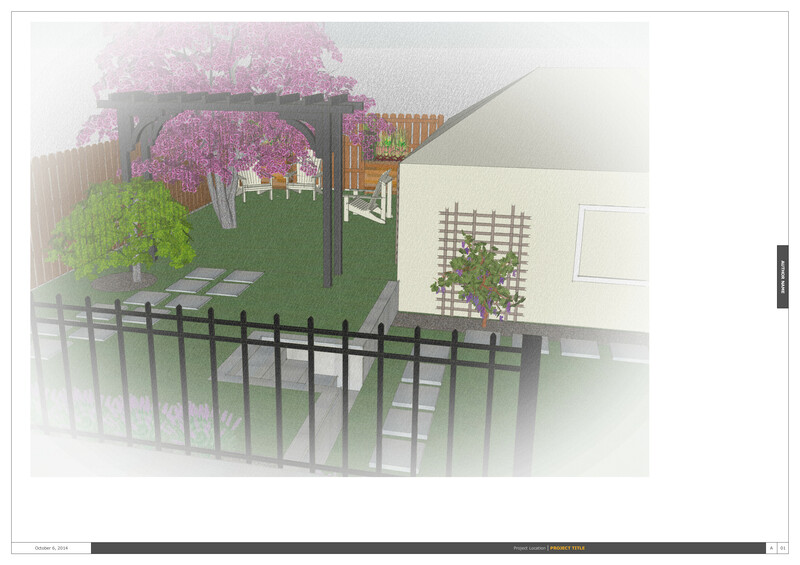 This entry was posted in design and tagged colour subtlety, formal style, Grade change, grade changes, landscape plan view, retaining wall, Richmond, SierraScape, SketchUP model, Vancouver by Janet. Bookmark the permalink. More nice work, Janet! Again, for the Vancouver project model, did you import the trees, fence and chairs from the 3D warehouse? I think it’s yes to all, but the Cercis may have come from 3D ArcStudio TreeMaker. Thanks, Janet. 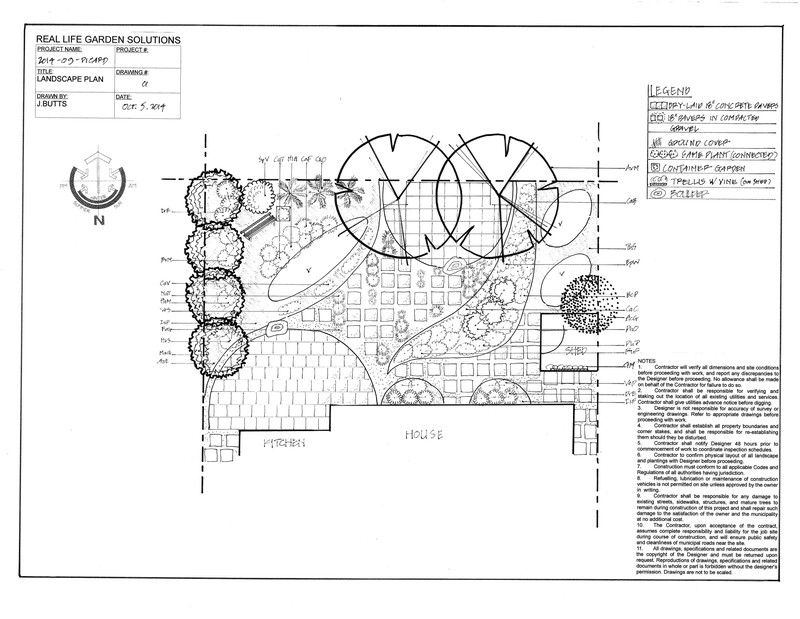 Aside from TreeMaker, are there any other resources you’d recommend for plant materials (to work with SketchUp and Layout)? PS. 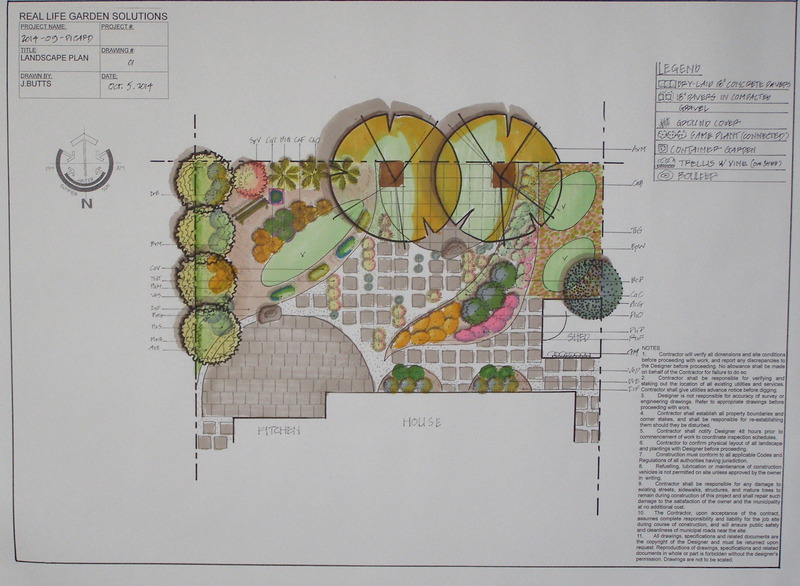 Really like the curvilinear beds in the second plan. Nice use of pavers, too. Do you have a particular 18×18″ you like? Abottsford Concrete’s Texada is nice. There are probably others out there. As for more SketchUp resources, there are others that are pay-per, but I’m sticking to the free for now. Free that is once you’ve bought SketchUp Pro. Nasella tenuissima and Festuca glauca.